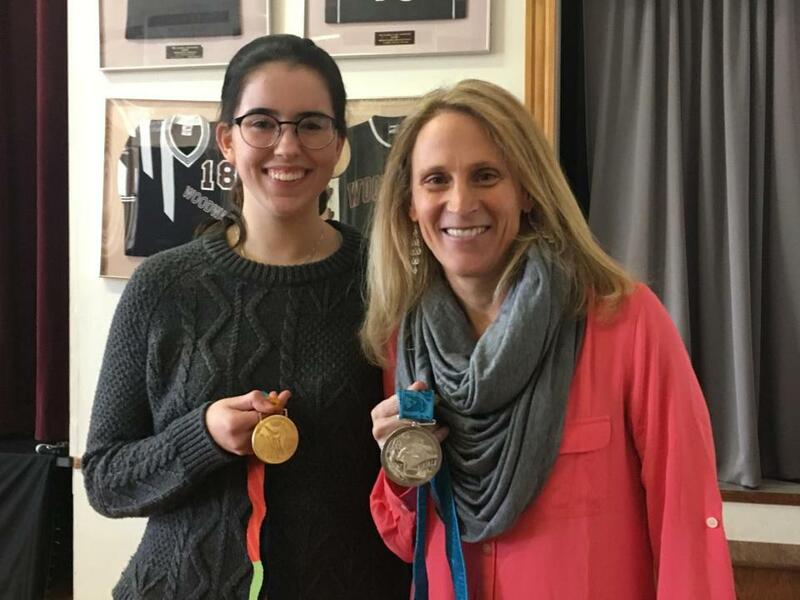 US soccer star Kristine Lilly showed one of her gold medals and her silver medal to Woodward School student and soccer player Kelly Lynch during a luncheon at the school on March 19. Olympic soccer star Kristine Lilly recently visited the Woodward School in Quincy and spoke to students in advance of the school’s fund-raising gala, where she will be honored. Lilly, a New England native, and Woodward alum Laurie Graf are receiving the school’s “Women of Distinction” award, and they were on hand to meet students during a luncheon on March 19. Past award recipients selected Lilly and Graf, said Walter Hubley, head of school at the all-girls institution. Lilly has won two Olympic gold medals and a silver medal with her teams, and twice has won World Cup championships. She has also fought for more equitable pay for female athletes and supports various organizations, including Boston Children’s Hospital. Graf, a Quincy native, is the founder of Center Stage Performing Arts Studio in Quincy. She has a long history with Woodward, which includes serving on its board of trustees, working as a school counselor, and serving as the dean of students. The school’s gala will be held April 3 at Granite Links Golf Club. Woodward is an independent school for girls grades six through 12 at 1102 Hancock St.